Help this gray fox run free! This gray fox was found hit by a car in Oakland—both of her legs so badly injured she was unable to walk. She was brought by caring rescuers to Lindsay Wildlife Rehabilitation Hospital last month. 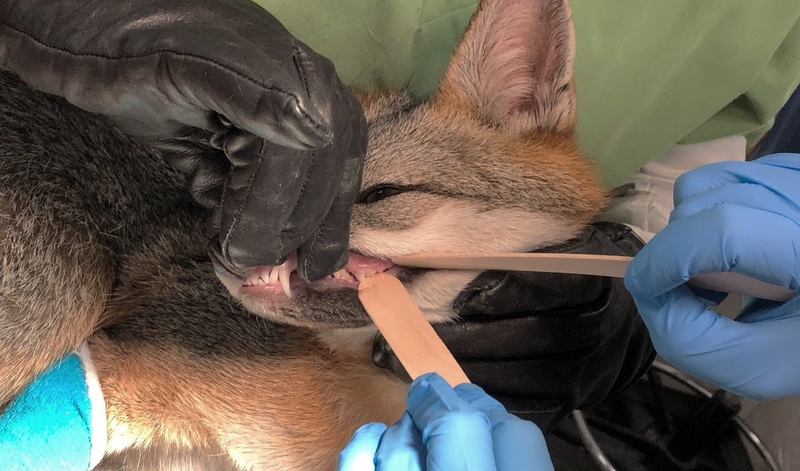 Our veterinary team worked quickly to stabilize the adult fox. They found she had severe head trauma, cracked teeth and lacerations on her front legs. After receiving sutures to close the wounds, she was given medication and a safe place at Lindsay to rest and rehabilitate. But recovery takes time. These injuries are not quickly healed. The cranial swelling was so severe that the fox showed concerning neurological symptoms, like a head tilt. Thankfully, over the last few weeks, that has improved, and we are guardedly optimistic that she will make a full recovery! This fox would not have survived without Lindsay’s life-saving work. She will likely stay in our care for several more weeks as we monitor her and make sure she can survive in the wild once again. Until then, the care and rehabilitation of animals like this gray fox comes at a cost. For our Oakland fox, her medical expenses are already more than $1,500. The medical and behavioral services of Lindsay Wildlife Hospital exist because of our kind-hearted, generous donors—as you know. wild animals do not come with health insurance! Today, on this Giving Tuesday, we are asking you to please consider donating $40 to cover one day of care for this gray fox and others like her who need our help. We are hoping to raise $10,000 by the end of the day. Won’t you please give now and help this fox return to the wild?